If you’re an art lover (like us), then you’re in for a treat when you get to Maui. The Lahaina Art Society was created by and for artists in West Maui, and as such, has one of the greatest selections of original Maui art you’ll ever see – at amazing Artist Direct Prices. 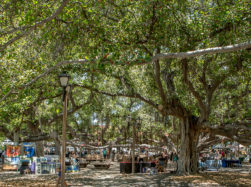 With two galleries located right in Lahaina Town on Front Street, between the Lahaina Cinema Center and Lahaina Harbor, you can’t miss them under the giant Banyan Tree. Both the Banyan Tree Gallery and the Old Jail Gallery are located in one of the oldest and most historic buildings in Lahaina, the Old Lahaina Courthouse, built in 1859, and located at 648 Wharf Street. Plus outdoor Art Fairs are held often, both under the Bany an Tree and at other locations – call them to find out exact times and locations. Friday night is art night in Lahaina, and you won’t be disappointed when you visit Lahaina Art Society. From the moment you enter their galleries you’ll be greeted by one of their artists and get to meet many others. Personalized Signatures from artists on the art you purchase are common too – something very rare at galleries. 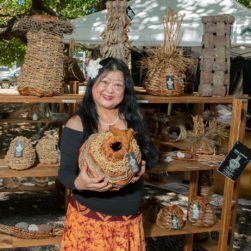 The styles of art you’ll see at Lahaina Arts Society are varied – and all very beautiful in their own unique way. At any given time you can expect to find hand carvings, oil paintings, blown glass, hand-made jewelry, exceptionally vibrant photography, ceramics, watercolors and much more. Plus, at Lahaina Arts Society, they feature both originals and affordable prints, which are perfect to take home as gifts for family and friends. 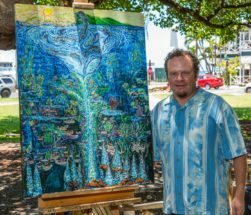 So if you make it to Maui, don’t miss out on the one place where you can find that special piece of art to bring home, that will always make you remember how wonderful your trip to Maui was. Find out more online by visiting LahainaArtsSociety, call them at (808) 771-0111, or just drop in. They’re open from 9am daily!